Bensheim/Germany, London/UK, 13 February 2018 – How can artificial intelligence, drug delivery systems and add-ons help to improve true medication adherence? 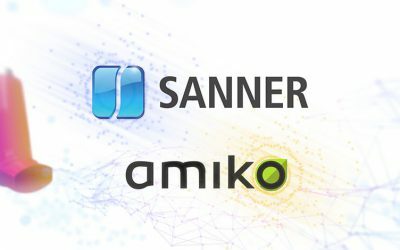 By combining long-standing experience in custom-made pharmaceutical packaging, dosing and delivery systems with advanced sensor technology, Sanner and the digital health start-up Amiko are set to provide innovative answers to respiratory and other chronic diseases. Amiko, winner of the 1st prize at the IBM Watson AI XPRIZE annual Milestone Award 2017, is upgrading respiratory care with sensors and AI technologies. Founded in 2015, Amiko has headquarters in central London and ISO 13485 certified R&D laboratories in Milan. Today, Amiko serves commercial, institutional, and individual customers in Italy, Germany, France, Spain, UK and the Netherlands, and is growing to become a global provider of advanced therapeutics data and digital disease management services, empowering patients, healthcare professionals, and payers to realize a shared vision of a digital health enabled future. For more information, please visit www.amiko.io. produces over two billion plastic units each year for standard and customized packaging and drug delivery solutions. For further information, please visit www.sanner-group.com. As corporate venture capital office, Sanner Ventures aims to explore new business areas and to invest in early-stage technology companies in the area of health and well-being. Sanner Ventures is devoted to products and solutions that help protect patient health and facilitate consumer engagement. For further information, please visit www.sanner-ventures.com.